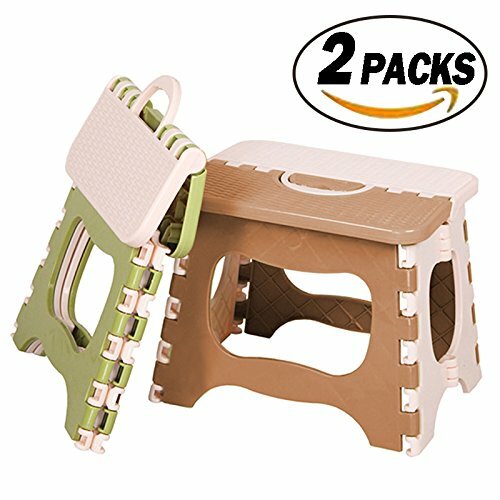 2pc mini folding stool for children. Green and pink colors combined,random color. The maximum can withstand 110 pounds of weight, is the child's exclusive stool. Small stool, fashionable, unique shape, wide range of uses, easy to carry. Ask me to handle. Comfortable to mention, put up can put away the expansion of the stool, you can use anytime, anywhere. Tightly closed, open and close the shaft, gently mention the stool can be Shoulong, not cardton. Thickening of the honeycomb, enhanced load-bearing, the internal use of a solid honeycomb structure design, bearing more. All ages. Laundry, children bathing, fishing, travel can be used. We are committed to providing the best service for every customer, your opinion is very valuable to us. If you have any questions (logistics, product quality and others), please don't hesitate to contact us and we will always provide the best service until you are satisfied. ---2packs plastic folding stool for children with non-slip surface and handy handle. The colors are pink and green,random color. ---Special convenience design, mini-volume, as long as the handle can be easily put the stool storage. ---The size of the stool is 18 * 23 * 19.5cm, the stool can withstand the weight of 110 pounds or less, it is suitable for children. ---Folding stools provide you and your children with convenience in the kitchen, bathroom, restaurant, camping and journey. ---The back of the chair is thickened to enhance the load. The internal use of a solid honeycomb structure design, bearing more strong. If you have any questions about this product by REVEW, contact us by completing and submitting the form below. If you are looking for a specif part number, please include it with your message.